We know that kids love animals and that kids are truly passionate about wanting to help our furry little ones. And, because of this, we are very happy to say that we have a way that kids can help! Kids in our area now have a way that they can easily contribute to our mission and help our furry friends – all while doing what they do best…. being creative!!! ALL kids entering this art contest will receive a special Thank You card in the mail “signed” by one of the pets currently available for adoption at the Pearland Animal Shelter. These pets truly want to thank our kids from our community for wanting to help them find their forever homes, and, therefore, each child will receive a special personalized “Paw Signed” Thank You Card – a true paw print of one of the many pets available at the Pearland Animal Shelter! Click HERE to download the 2019 Kid’s Art Contest Flyer. Click HERE to download the 2019 Kid’s Art Contest Entry Form. Must be hand drawn or painted with no stencils, templates, etc. Child must begin drawing/painting on a blank piece of paper. Child has the choice of drawing or painting with pencil, pen, markers, colored pencils, crayons, water color or other paints (or a combination of these). Deadline is Wednesday, May 8, 2019 by close of business at participating entry drop-off business locations. One overall Grand Prize Winner of all age groups awarded. Artwork is entered in our live auction to be sold at the Wags to Riches Gala & Casino Night hosted by Killen’s Steakhouse on Sunday, June 2, 2019. 1st, 2nd and 3rd Place Winners awarded to each age group. Artwork is entered into our silent auction to be sold at the Wags to Riches Gala & Casino Night hosted by Killen’s Steakhouse on Sunday, June 2, 2019. Present Winning Artwork to All Guests at the Wags to Riches Gala & Casino Night for Live Auction – Artist will present (and show off) their artwork to all Wags to Riches Guests during the Live Auction. Artist will have a short “interview” immediately prior to their artwork being auctioned; artist (and parents) to be present during the Live Auction of winning artwork). 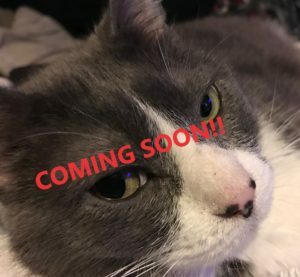 Design a Shirt & Coffee Mug – Winning artwork will become the design of a t-shirt and coffee mug that will be available for online purchase to support Pearland Pets. A keepsake Event Program for parents. 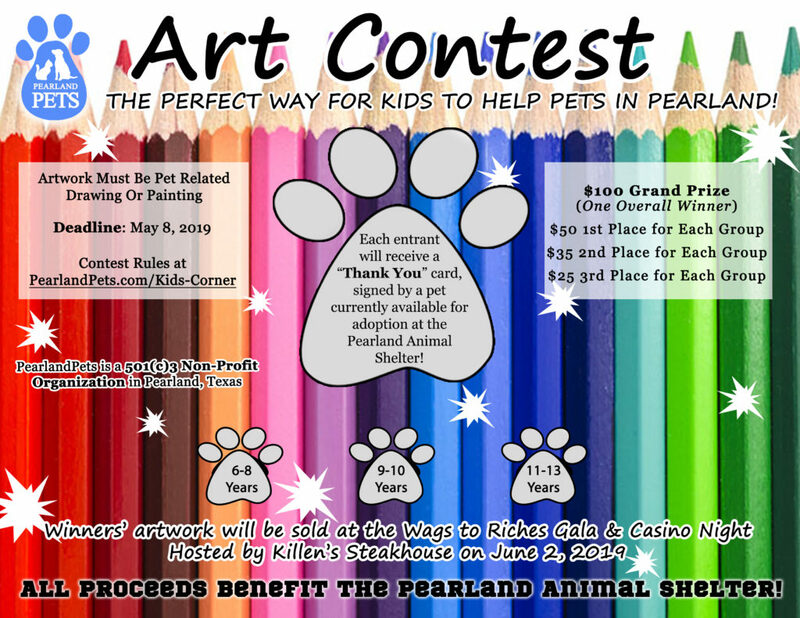 All artwork submissions/entries become property of Pearland Pets and cannot be returned. Please do not submit/enter anything that needs to be returned. By entering this art contest, you (parent/legal guardian of child) grant us permission to post artwork on our website and social media, as well as for artwork to be sold and/or auctioned for sale for charity purposes on our website, social media and/or at physical locations within the Pearland, TX area. You (parent/legal guardian of child) grant us permission to use child’s name and age of child which may accompany posted artwork. All proceeds from said sales/auctions benefit Pearland Pets, a 501(c)3 non-profit organization whose mission is to support Pearland Animal Service & Adoption Center. Winners will be chosen at the sole discretion of a panel of judges comprised of and appointed by Pearland Pets. All decisions are final.